Cornice at the top of the couloir. There's rock fall potential, and this is definitely avalanche terrain. I recommend a springtime descent. Fantastic springtime skiing. 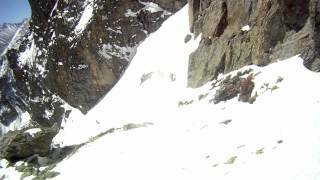 It's very common to skin up Flattop or to climb the couloir from Emerald Lake. From the top, there are two entrances—the classic entrance is to the looker's left, and the Incisor entrance is to the right. The Incisor is probably skied more commonly since it's not as steep or narrow as the classic line, however it does involve an exposed traverse over a cliff band where it connects to Dragon Tail. After the two entrances merge, the couloir gets much wider and far less steep. From there out, it's a consistent, mid-30s slope the rest of the way making it an absolute blast to ski. After you get out of the couloir, there's an apron to ski down to get to Emerald Lake. This apron can be enough fun on its own that people lap it on clear days. Awesome! Climbed in and road down skier's left. Steep and in my face up top!